Projecting Ebira image to the world! Ebira News, People, Lifestyle, Events and more. Ebira Tao is the largest of the several Ebira groups found in about 8 states of Nigeria including the Federal Capital Teritory (FCT). The other sister groups are Egbura Koto and Ebira Mozum (Kogi state), Ebira Panda, Ebira Oje/Toto (Nassarawa state), Ebira Etuno (Edo state), Ebira Agatu (Benue state) Ebira Oloko (Ondo/Oyo/Osun states). Written records about the origin of the Ebira people were those compiled from palace sources by the British colonial administrators in early 20th century. The Ebira, through oral tradition, trace their descent to Wukari (in the present Taraba state) where they were a constituent part of the Kwararafa confederation. In about 1680 AD, they (along with the Idoma and Igala) migrated out of Wukari a chieftaincy dispute. The Ebira later split into various groups and settled in different locations between 1680 and 1750 AD. The Ebira Tao first sojourned with the Igalas at Idah but later crossed the River Niger and settled at Ebira Opete located the vicinity of Upake in Ajaokuta LGA. The 'father' of the Ebira Tao who led them to this premier settlement in Ebiraland was Itaazi. Itaazi had five (5) sons who all later migrated from Ebira Opete and were the founders of the various districts in Ebiraland. The children and the districts they founded are Adaviruku/Ohizi (Adavi), Ododo (Okehi), Obaji (Eyika), Uga (Okengwe) and Ochuga/Onotu (Ihima). His daughter named Ohunene settled in Eganyi district. Members of the various clans in Ebiraland are descendants of the children of Itaazi. Ohizi had five children who are progenitors of the five traditional Adavi clans named after them. These are upopo-uvete (Apasi), Uka, Idu (Aniku), Adeyika and Uhwami. A migrant group from Eganyi known as Ezi-Onogu clan is also found in Adavi. The sons of Ododo who are the ancestors of Okehi clans were Okovi Oviri and Enwgukonyai. Obaji the founder of Eika had ten children named Ohiaga, Iyewe, Avassa, Ehemi, Anchi, Epoto, Egiri, Ubobo, Ogu and Eyire. Uga of Okengwe had two sons whose children constitute the present Okovi and Agada group of clans. Due to a sizeable concentration of other Ebira clans in Okengwe district, they formed a socio-political coalition known as Ada-ehi. Ochuga had six children and their descendants make up the six clans in Ihima. These are Emani, Oha/Idu, Ohueta, Ure, Ohongwa and Odumi. The seventh clan is Akuta who migrated from Okengwe. Though Itaazi's daughter named Ohunene was the founder of Eganyi, not all the clans there are descended from her. Eganyi clans are Ede, Esugu, Eheda, Ogu, Onoko, Idu, Anavapa and Ogodo. The Aningere who are skilled craftsmen are found in all districts. They are, however, more concentrated in Okengwe and Adavi districts. Ebiraland, the home of Ebira Tao, is located in the central senatorial District of Kogi state. It has a landmass of 3,426 sq km. The 1991 national census puts the population of the area 722,032. Another national head count was undertaken in 2006. The provisional figure of 884,396 released by the National Population Commission (NPC) is being disputed. It is distributed as follows: Okene LGA (320,260), Adavi LGA (202,194), Okehi LGA (199,999), Ajaokuta LGA (122,321) and Ogori Magongo LGA (39,622). The Ebira people are republican by nature, outspoken and very hard working. Farming and cloth-weaving are occupations for which the Ebiras are well known. They are presently spread in five Local Government Areas of Kogi state namely: Adavi, Okene, Okehi, Ajaokuta and Ogori-magongo. A sizeable number is also found in Lokoja Local Government Area and Oyo states. The paramount ruler of the people is called Ohinoyi of Ebiraland. 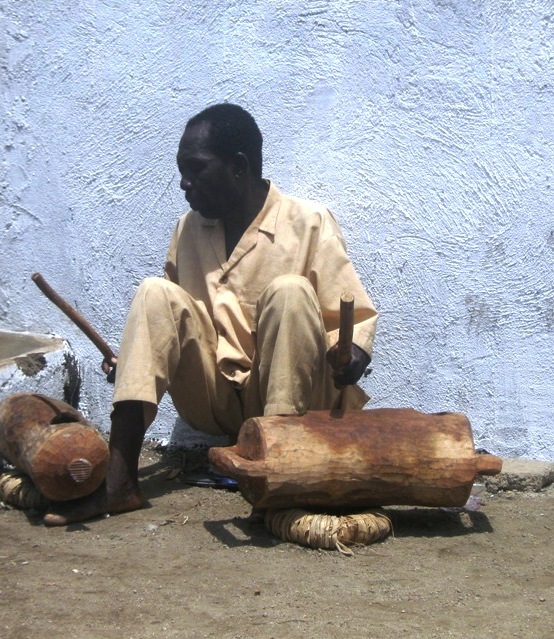 The Ebira cherish their traitional festivals in spite of the infiltration of some negative tendencies. 11. Ovanesi - War commander during the Ebira/Bassa war where the Bassa were defeated (1890). 14. Onono Idogido - Great social crusader and leader of 1951 women revolt against taxation. 15. Raji Abdallah - nationalist who fought for Nigeria's independence along with Nnamdi Azikiwe and Obafemi Awolowo. He was imprisoned by the British colonialists. The Ebiras have several annaul cultural festivals. Three of the most prominent ones are 'Echane', 'Eche Ori' and 'Ekuechi'. This is an annual masquerade festival celebrated in rotation from one district to the other in Ebiraland (between April-June). In the past, it was only during the period of the festival that betrothed girls were given away in marriage to their suitors. That is why the festival is called 'Eche-ane' (women festival). Masquerades, though carried long canes, came out primarily to entertain people and received gifts in return. It is regrettable that this very popular and interesting festival has been bastardized and now a source of constant breach of peace. 'Eche Ori' is a new yam festival celebrated only in two districts in Ebiraland. These are Ihima and Eganyi. During the festival, traditional worshippers make sacrifices in the secret groove of 'Ori' (deity) high up in the mountain to show gratitude for its protection and provision of bounteous harvest. The worshipers carry long canes with which they whip one another in turns without anyone exhibiting any sign of pain. This is a mark of strength or manhood. Another important attraction of the festival is the delightful 'Echori' music in which female singers feature prominently. Only after this festival can one eat or sell new yams in the market as it is a taboo to do so before the festival in Ihima and Eganyi. This is a night masquerade festival which marks the end of the Ebira calendar year and the beginning of a new one. Ododo is popularly acclaimed to be the initiator of this masquerade festival. The 'Akatapa' masquerade in heralding the beginning of the festival often say "Irayi ododo osi gu, Irayi akatapa osi gu eeeh! Osa yeeeh!" which means "the year of the Ododo has ended; the year of Akatapa has ended. Here is another year". The festival begins with a festival eve in which folk singers (ome ikede) perform to the delight of both men and women. The following day, the real festival in which masquerades sing and dance to entertain people from dusk to dawn takes place. It is restricted to men only so all women stay indoors throughout the duration of the festival. All dead relatives are believed to return to a earth on a visit this night, so, women prepare delicious 'Apapa' (bean read) and he-goat meat for the visitors. The women also, at times, leave monetary gifts with the men for the visiting dead relatives. Trust men, the meals and gifts are properly and neatly delivered to the beneficiaries who only the men have the privilege of seeing and interacting with, that night. outstanding start to a genuine record of account.well written but details will make an interesting master piece.well done! I love this. God bless Ebira land. Great research work, well done! Good one, brief but very reach. More grease 2 ur elbow Mr. S.S Salami. Weldone 4 d great job. Proudly ebira. Proudly ebira. Tao. Well written piece. God bless you and all the ebiras. Thanks sir.good one god bless u.
Dats nice nd gud,God bless ebira pips,Ohomorihi oooo za abai godo AMIN. nice piece@Salami, gud to knw more about my root, shalom ebiraland! Please include your name in your comments. Born on 7th Feb. 1929. He assumed the office of Ohinoyi of Ebiraland, 2nd June 1997, after the passing away of the former Ohinoyi, Alhaji Sanni Omolori who ruled for 40 years and 40 days as Ohinoyi of Ebiraland. Alh.(Dr. )AbdulRahman Ado Ibrahim attended a Nursery and Quranic School and later finished his primary education from NA School in Okene, Kogi State in 1940. He later went to Ondo Boys high School and Oduduwa College and rounding up his secondary education in 1949. He obtained a B.Sc in Economics from London School in 1954 and an MBA from Harvard business School, 1959. 2004-2010. EbiraView Media & Technology Services. All rights reserved.